My husband and I didn’t have much debt during or right after college, but we didn’t have much money either. That meant that the one car payment we did have was extra annoying. We had day jobs but we wanted to earn a little more to help pay down the car loan even faster. That’s when we looked around and my husband realized that he had about 10,000 Magic: The Gathering cards that he wasn’t using. With those cards and my existing experience using Ebay to sell text books, we started making a little extra money. I researched all of the mixed packs of Magic being sold on Ebay, and we just priced ourselves a tiny bit lower and included a better mix of cards. I also would swing by the post office every day on the way to work, so our shipping speed was phenomenal. Fast turn-around times on Ebay usually means repeat business. Once it was obvious that we were going to run out of cards to sell within a couple of months, I also started buying giant inventories of Magic cards in bulk and we would resell those in smaller mixed packs too. We made sure to only buy bulk packs that we could resell for a minimum of twice as much when resold. This success drove us to continue for about 6 months. By then, we had both found better jobs and decided to take an Ebay break in favor of more free time. We had brought in about $1000 after expenses that we threw at my car loan. Not too shabby for about 5 hours of work per week (better than minimum wage back in 2005). The only issue with stopping was really the excess inventory that we ended up with. To this day, we still have about 50,000 extra Magic cards all sorted and filed (and taking up space) in the crafts room along with stuff from our other hobbies. I have considered restarting our online business long enough just to get rid of some of the excess, but my husband has grown a little attached. He and some of our friends enjoy making lots of different types of decks and testing them out with what we have on hand now. Have you ever started a side job to help make some extra debt payments? What sort of job? My brother and his friends used to be obsessed with Magic! Wow, I’m shocked Magic Cards are in such high demand. Good for you. I haven’t figured out how to use ebay successfully just yet. I have a bunch of clothes I’d like to sell, maybe I’ll try on ebay. 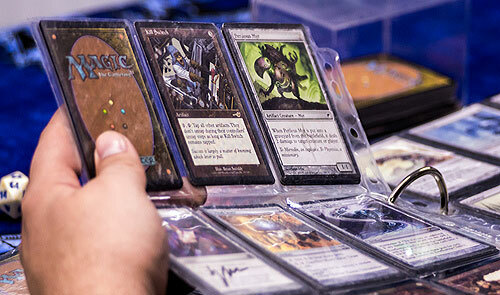 Magic cards, wow…sounds like a fun hobby and the fact that you made something out of it makes it even more awesome. @Lisa E, my husband goes on again and off again. @Stefanie, if Ebay isn’t your thing, you may want to drop off those clothes at a consignment store – I’ve made about $20 on old stuff at one near my house. @Simon, that’s pretty awesome too!